As California’s cities continue to grow and increase density, it is important to understand how best to meet the growing energy and energy assurance needs. Living in California provides an advantage other regions don’t have – sun and political will. California is the Golden State, and with an average of 70% days of sunshine (Bay Area region) and the new Title 24 solar mandate, California is in the prime position to be a leader on solar and renewable energy. This LGSEC Member Spotlight showcases how solar panels can be used to reduce California’s reliance on non-renewable energy sources on a day-to-day basis as well as in the case of an emergency. The Berkeley Energy Assurance Transformation (BEAT) project team conducted a comprehensive research analysis to uncover what it would take to design a replicable clean energy microgrid model to provide and share solar energy between key buildings in an urban center both for everyday use as well as for clean back-up power. The goal of BEAT was to come up with a microgrid design that could provide backup solar battery storage power for up to seven days post-natural disaster in order to minimize diesel generator use. Co-benefits of this proposed design include additional renewable energy, and a reduction of greenhouse gas emissions. Prototype 1 is a multi-facility microgrid that includes the four City-owned buildings: Center Street Garage, Civic Center, Civic Center Annex, and the Public Safety Building (Figure 1). These buildings would be connected through underground distribution lines. 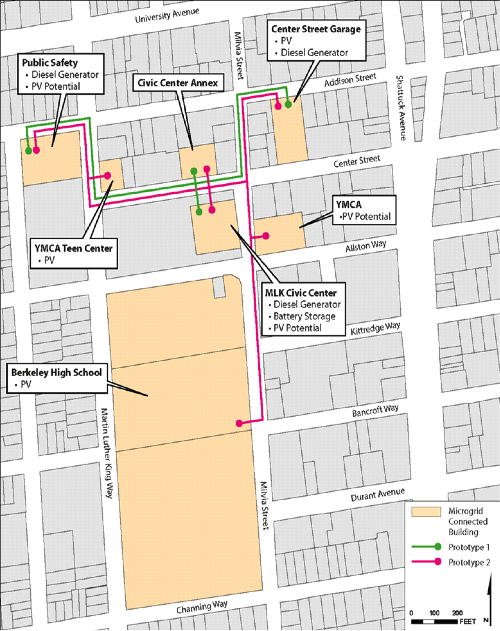 Prototype 2 expands on the Prototype 1 by adding connections to Berkeley High School, the YMCA, and the YMCA Teen Center (Figure 1). In emergency situations these additional buildings can serve as care shelters. Multiple building owners, regulatory, and contractual challenges are involved in this prototype. Prototype 3 is an islandable solar + storage system that would encompass the Center Street Garage, Civic Center, and the Public Safety Building. This option is more affordable because it does not require the underground distribution lines required in Prototypes 1 and 2. This simpler design is ideal for single buildings but does not allow buildings to share energy due to the omitted distribution lines. Regulatory Analysis– Due to the California Public Utilities Commission (CPUC) code that prohibits non-utilities from distributing power among the public, a local utility would have to own and operate the distribution lines required for Prototypes 1 and 2. Further, the local utility, PG&E, would charge a monthly fee for operation and maintenance of the new distribution lines. In order to ensure that the new distribution lines were only used for microgrid customers, an exception would need to be filed with the CPUC. The microgrid would also need to negotiate a single master meter scenario with the local utility in order to be able to share power and balance energy needs and generation between multiple buildings. Technical Design– A fully-connected microgrid highly depends on the proximity of the buildings, the solar potential of each of those buildings, and the amount of non-microgrid users on the existing distribution lines. The microgrid would be designed to use a lithium-ion battery for optimal charging and discharging attributes. In addition, solar and generation needs are contingent on being able to share load. There are costs and regulation issues associated with oversizing both solar and batteries. Financial Analysis– Installing new distribution lines is expensive. In addition, the local utility would charge an operation and maintenance fee for all the new infrastructure. Since there is no existing tariff for microgrids during an outage, there would need to be a tariff created in collaboration with the utility and CPUC. Prototype 3, the solar + storage system, is the only cost-effective solution at this time. However, it must be noted that this prototype is a stand-alone solar and storage system for a single building and does not connect buildings together to share power. BEAT received an Electric Program Investment Charge (EPIC) Grant from September 2016-June 2018. Funds from the California Energy Commission equating to $1,499,214 were also provided for the creation and research of these prototypes. Installing any of the prototypes consists of various costs because of the large amount of specific infrastructure required, the coordination needed to connect resources and information, and the ongoing maintenance and quality assurance costs that all greatly vary depending on the implementation site. However, the environmental, economic, and resilience benefits offsets these costs for current and future generations using the microgrid. BEAT is currently pursuing further funding opportunities and grants to implement the installation of solar and storage at several critical facilities, including the City of Berkeley, to eventually achieve a fully connected microgrid. Association of Bay Area Governments (ABAG)*, CAISO, Center for Sustainable Energy (CSE)*, California Energy Commission, Interface Engineering, Lawrence Berkeley National Laboratory (LBNL), NHA Advisors, PG&E, URS Corporation (URS), and West Coast Code Consultants, Inc. (WC3).